FastBill: The accounting software for you business! Fastbill automates your daily business and organizes your invoices, receipts and banking. 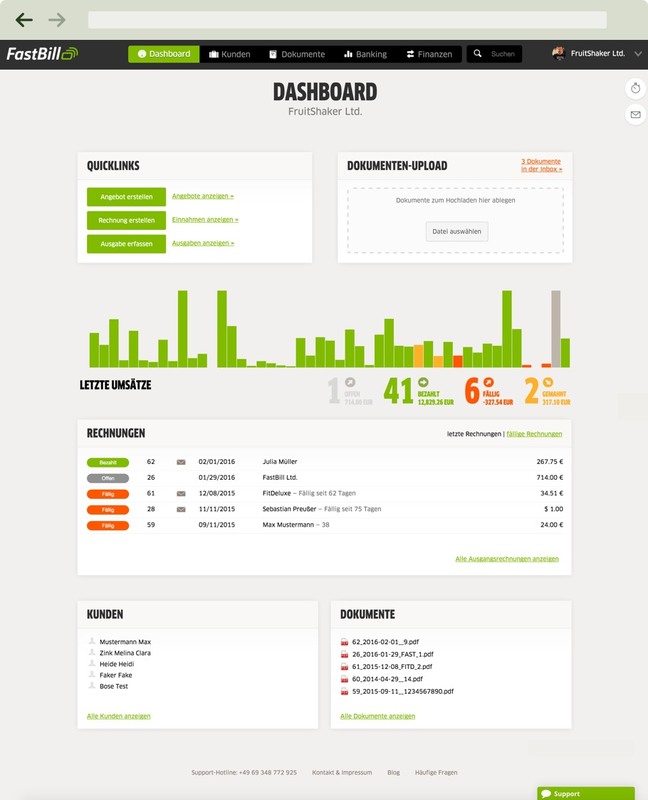 FastBill - especially developed for small businesses and freelancers. Create professional quotations, invoices and reminders with your individual) template in minutes. Keep an eye on your financial ratios and customers. With FastBill you'll always have the overview. Collect your receipts wherever you are. It's always accessible via mobile apps. Do your monthly statement online and send it with the touch of a button to your tax consultant. With FastBill Premium it has never been easier to be an entrepreneur. Take care of your success, we take care of the rest. Easy, secure, automated. Don't worry about receipt management. Forward everything to us. We key in necessary data, process it for taxation and everything is securely archived. We will take the burden off your shoulders so that you can fully concentrate on your work. So your head is clear for the really important things. More time, more life, more success. We take care of the complex things or make it really easy for you, to tick them off. Therefore you can rely on our outstanding support. Do don't need any workshop or expert. Thanks to cloud technology you can work anywhere. Work online together with customers, your team or your tax consultant.